The LANEW series offers 2 watts of output power from a 21.8 x 9.2 x 11.1 mm package without derating to 85ºC and without external input/output capacitors. 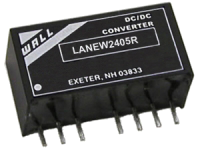 The LANEW series has 2:1 wide input voltage ranges of 4.5-9, 9-18, 18-36 and 36-75VDC and features 1000VDC of isolation and short-circuit protection. 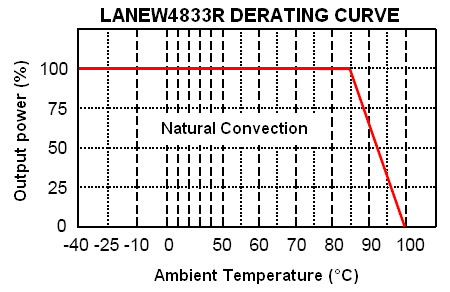 The LANEW series meets EN60950 and UL60950 requirements. All models are particularly well suited to telecommunications, industrial, mobile telecom and test equipment applications. Dimensions: 0.86in. × 0.36in. × 0.44in. Notes: 1.The LANEW series requires a minimum 10% loading at the output to maintain specified regulation. Operation under no-load condition will not damage these devices, however they may not meet all listed specifications. 2. It will not damage the device without inserting external input capacitors. There is a smaller reflected ripple current when a capacitor is put at the input. The capacitor recommended use "CHEMICON" LXZ series or equivalent for 05 & 12Vin. Use "CHEMICON" KMF series or equivalent for 24 & 48Vin. 3. BELLCORE TR-NWT-000332. Case: 50% Stress, Temperature at 40°C. 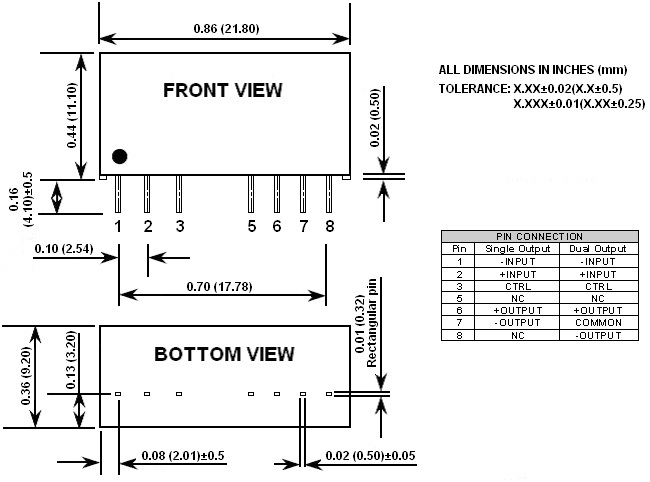 (Ground fixed and controlled environment). 4. The LANEW series meets EN55022 class A with a filter at the input. The filter capacitor recommended is same as note2.